This mini album was made with three 12" x 12" black sheets of cardstock, which makes a 6"x 6" album. 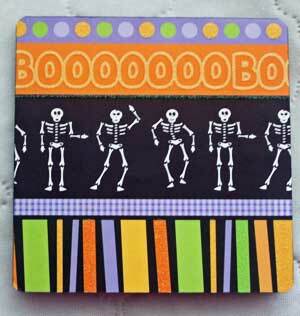 It is then decorated with all kinds and different brands of Halloween patterned papers. Although you can not add anything bulky to this kind of album, there is plenty of spaces for your trick or treaters' photos. The front or inside pages of the squash book ready for photos and journaling. The back of the mini book with the covers at either end.